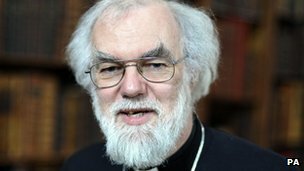 Archbishop of Canterbury Dr Rowan Williams has announced he is to stand down in December. He is stepping down and will take the position of Master of Magdalene College at the University of Cambridge from January 2013, his website says. In a statement on his website, the head of the 77 million-strong the Anglican Communion said serving as archbishop had been "an immense privilege". He said stepping down had not been an easy decision. He added that during the time remaining there was "much to do" and thanked those in the Church of England and the wider Anglican Communion who had "brought vision, hope and excitement" his ministry. "I look forward, with that same support and inspiration, to continuing to serve the Church's mission and witness as best I can in the years ahead," he said. Church members will be surprised and some will be greatly troubled. There will be a sense of bereavement about him leaving. He has become a very revered figure. He took on an almost impossible job. Most people, even though he has enemies on both the more right-wing and liberal side of the Church, each would respect the way he has dealt with the problems the Church has had. His resignation is not that surprising - Dr Rowan Williams never wanted this job. He was a reluctant Archbishop of Canterbury. But he came into office of feeling he was called to a job but there were few candidates for. He hoped to recapture the imagination of the public for Christianity. But his 10 years in office have been hugely dogged by the disputes, especially over homosexuality. Lambeth Palace said the Queen, as Supreme Governor of the Church of England, has been informed. Dr Williams will continue to carry out all the duties and responsibilities of the Archbishop of Canterbury, both for the Church of England and the Anglican Communion, until the end of the year, Lambeth Palace said. The Crown Nominations Commission (CNC) will consider "in due course" the selection of a successor. The Archbishop of York, Dr John Sentamu, said he had received the news "with great sadness". "The last decade has been a challenging time for the Church of England and the Anglican Communion," he said in a statement. "Thankfully, Archbishop Rowan is a remarkable and gifted leader who has strengthened the bonds of affection. "Despite his courageous, tireless and holy endeavour, he has been much maligned by people who should have known better. For my part he has been God's apostle for our time." Dr Williams' resignation marks the end of more than 20 years as a bishop and archbishop. He was consecrated bishop of Monmouth in 1991 and elected archbishop of Wales in 1999. His departure comes after tensions within the Anglican Communion over the issue of homosexuality and women bishops. Dr Sentamu is widely viewed as the front-runner to replace Dr Williams, and would become the first black Archbishop of Canterbury if so. Other possible contenders include Richard Chartres, the Bishop of London, the Rt Rev Nick Baines, who is the Bishop of Bradford, and the Rt Rev Tim Stevens, Bishop of Leicester, who leads the Church of England bishops in the House of Lords. In an interview about his potential successor, Dr Williams said: "I would like the successor that God would like. "I think that it is a job of immense demands and I would hope that my successor has the constitution of an ox and the skin of a rhinoceros, really. "But he will, I think, have to look with positive, hopeful eyes on a Church which, for all its problems, is still for so many people, a place to which they resort in times of need and crisis, a place to which they look for inspiration. "I think the Church of England is a great treasure. I wish my successor well in the stewardship of it."